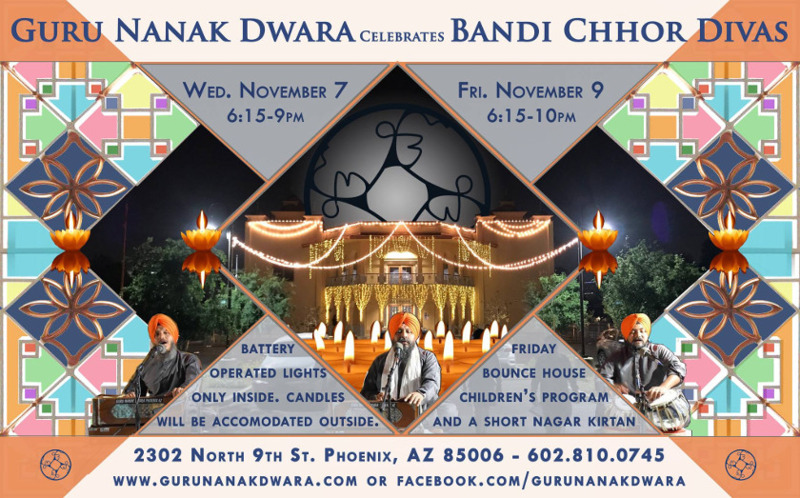 Guru Nanak Dwara (Sikh Temple on 9th st and Oakst) Invites all. We are having BandiChhor Divas (Diwali) this Friday Nov 9th at 6:15-10PM. Will plenty of free food(Langar)and events for kids..I.E. Bounce house, slide and other things orientedtoward kids. The Guru Nanak Dwara Sadh Sangat celebrates Bandi Chorr Divasand Guru Hargobind Ji's heroics freeing 52 Rajas from prison. We invite the entire Sadh Sangat to join together to remember this noble act ofGuru Hargobind Ji. Last year, the Sadh Sangat came en masse to this special event as seen in theevent photo. We look forward to seeing you all there!